“All Bette’s stories have happy endings. That’s because she knows where to stop. She’s realized the real problem with stories — if you keep them going long enough, they always end in death.” Neil Gaiman, Sandman. If you’ve encountered Pelgrane Press’s Trail of Cthulhu RPG, you will know that it has two modes of play: pulp and purist. Pulp adventures are action-packed romps where the heroes fight the forces of the Mythos and stand a chance of winning. In purist adventures, the expectation is that there is no chance of success. They represent the slide into madness and death, with the climax taking the form of a revelation of how hopeless the situation is rather than a battle against dark forces. The best you can hope for is to survive, and often even that isn’t the case. 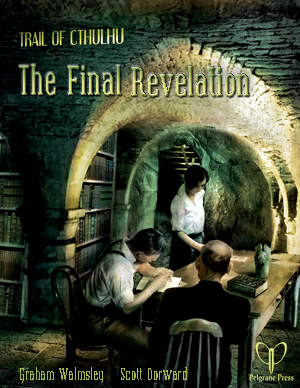 The Final Revelation, the collected edition of Graham Walmsley’s purist adventures for Trail of Cthulhu, will be out later this month. I had the pleasure of contributing a framing adventure which ties the four largely unrelated scenarios together, executed in the fashion of the classic Amicus portmanteau horror films. After I thought about ways of softening the scenario, finally deciding not to, I began to wonder why purist scenarios would appeal to anyone. The author of that playtest report made a very good point. This is meant to be a leisure activity, so why would you spend that time depressing yourself? This, in turn, is part of the larger question of why we enjoy horror stories. A great many horror films are fairground rides, giving us quick, superficial scares, or shocking us with Grand Guignol blood and guts, but returning us safely to the ground afterwards. Some are more subversive things, which burrow into our brains and unnerve us long after they have finished. I think it’s safe to say that the former are more popular, but the latter become the classics of the genre. How the story resolves is a large part of what differentiates these films. When a horror film or story has a happy ending, I often feel cheated. In many cases, a horror story is about a sudden and bizarre intrusion into someone’s everyday life, and the story is a battle to not only survive but to restore the status quo. There may be losses along the way, but a happy ending shows us that families and relationships will survive adversity, that we will save the people we love, that we can rebuild our lives when they break and that if we persevere, everything will be all right. The ideal situation for the protagonists is for everything to go back to the way it was at the start of the story, before the bad thing happened. Life isn’t like that, though. We may overcome adversity, but we are changed by it. In many cases it gets the better of us. We will experience the deaths of friends and family, develop physical or mental illnesses that stay with us for life, have loving relationships fall apart and, ultimately, die ourselves. Everything will not be all right. While experiencing a story or playing a game where the protagonists overcome horrors can be soothing, living vicariously through a tragedy or horrific demise can prove cathartic. Our dreams are often worst-case scenarios, preparing us emotionally for some of the shocks that we fear, and stories and games can do the same. Even if the protagonists are destroyed by what they face, we, as players or the audience, are quite safe. We can live through their deaths. Also, stories are fundamentally about change. Even if everything is all right in the end, the protagonist is still altered by his or her experiences. Of course, if the status quo is not preserved, the change is all the more dramatic and affecting for the audience. The majority of horror RPGs address this through a variety of sanity or personality mechanics, tracking changes to characters via statistics and descriptors. The structure of most scenarios, however, is about trying to make sure catastrophic change does not occur. The classic template for a Call of Cthulhu scenario is a group of cultists wielding forces which man was not meant to understand, trying to bring something dangerous and abhorrent into this world. It is the duty of the investigators to stop this happening. If they succeed, everything goes back to normal. Personally I find this frustrating. When I play a game, I want the most interesting, surprising and exciting things possible to happen during play, whether these are good or bad for my character. In too many horror games, your purpose is to identify the most interesting thing that could happen and to ensure that it never comes about. This may help guarantee the long-term viability of a campaign or group of characters, but it feels anticlimactic to me. The draw of the purist style is that the most interesting thing will happen or has already happened. There is nothing you can do to stop it. Your world will get worse and you will have nightmares or destruction to contend with. This is rarely dull. In my experience, these are the games that players talk about in hushed tones for years afterwards. Sure, their characters may have finished the game by sitting in a dark corner, rocking back and forth, or blowing his or her own face off with a shotgun, but there is rarely a sense of disappointment. –Things going very wrong in a modern scenario, “Lockdown”. Things weren’t ever going to be all right. And, one player asked if there were any way to win, i.e., not wind up in that situation. There was, and the fact that there was made the total loss fine with him. –Things going very wrong in “Hysteria”, set in a 19th century mental institution for women (which is plenty horrific there). Again, there was a way to win. And we totally EARNED our failure! It was glorious! I mean, it would not have been beyond the pale for the PCs to go into investigation mode, but many of them really did belong in a mental institution, and we played that to the hilt. The You Too Can Cthulhu crew played absolutely fair; the PCs had ample, if cryptic, warning. It wasn’t simply that we had a chance to win — we had a choice, which, on the player level, matters. We didn’t choose win / not win so much as go dark places and see what happens. –“A Night to Remember”, set aboard the Titanic, where the PCs won in that the intrusion was foiled (and this was not a guarantee), but that wasn’t the amazing thing. The amazing thing was that we sat there, mesmerized, as the Keeper read to us a long description of the Titanic going down. While this was interspersed with cutting to the women PCs (on a lifeboat) and the men PCs (valiantly staying on the doomed ship to give the women and children seats), I wouldn’t have believed I’d enjoy being pure audience for something straight out of the history books that never particularly interested me. So, a chance to win, choices that mattered, and this third thing, a sort of dark wonder at the horror of disaster. –When I ran Tatters of the King, the PCs won, saved the world, all that. Two were trapped in Carcosa, one by his own choice, as he just couldn’t think of any good reason to return, one forever lamenting that she chose safety over artistic integrity. Of the ones remained, one was a Catholic who had lost his faith during the campaign, one a homosexual man so closeted he never consciously realized it, who lost two men he’d been in love with and who married a woman he’d met on a cruise ship because it was the Expected Thing. Four out of five lives utterly changed and blighted. (The fifth was an odd case, and quite likely to become an evil sorcerer some day.) Chance, choice, and a curious artistry. It’s a tricky mixture.